Welcome! - Phatch = PHoto & bATCH! Phatch is an user friendly, cross-platform Photo Batch Processor and Exif Renamer with a nice graphical user interface. Phatch handles all popular image formats and can duplicate (sub)folder hierarchies. Phatch can batch resize, rotate, apply shadows, perspective, rounded corners, … and do much more actions in minutes instead of hours or days if you do it manually. 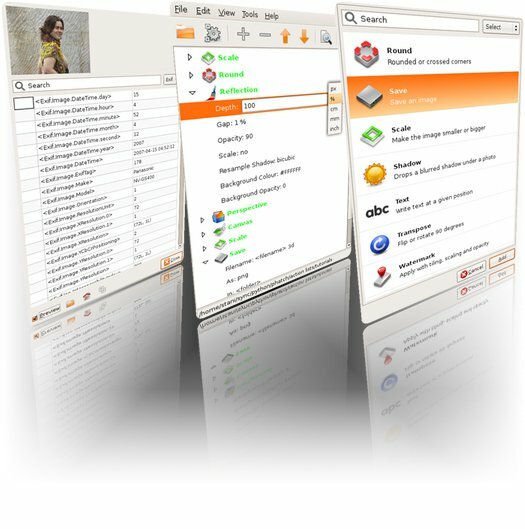 Phatch is open source and works on Linux, Mac Os X and Windows. The only purpose of this wiki is documentation. Bug reports and blueprints (feature requests) should be registered at launchpad.